The cartoons will be sent in electronic format, JPG, 300DPI, with a maximum size of 2 MB. The works will be an originals and accompanied by a brief biography, including photo, address and phone number. The technique of making cartoons is participant choice. Prizes: First prize – 500 EUR, Second prize – 300 EUR, Third prize – 200 EUR, Other Special Prizes offered by the sponsors may be awarded. The jury s decisions are final. The cartoons author consent that the cartoon or cartoons send will became the property of the Organizer. The Organizer is entitled for all reproduction right for any cartoon registered in competition. The Organizer dose not assume any responsibility for any breaches of copyright, exclusive responsibility lies with the one who sent the cartoon. The cartoons that will win the first, second and third prize should be sent mandatory in original version to the Organizer. In the absence of interbank relations between Romania and the country of origin of the winner, the Organizer is relieved of any liability. 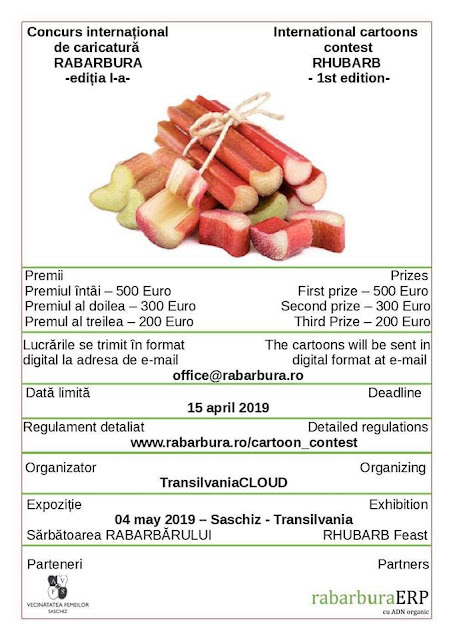 By submitting the works to International Rhubarb Cartoons Contest 2019, the artist accept the decisions of the jury and the rules printed above. 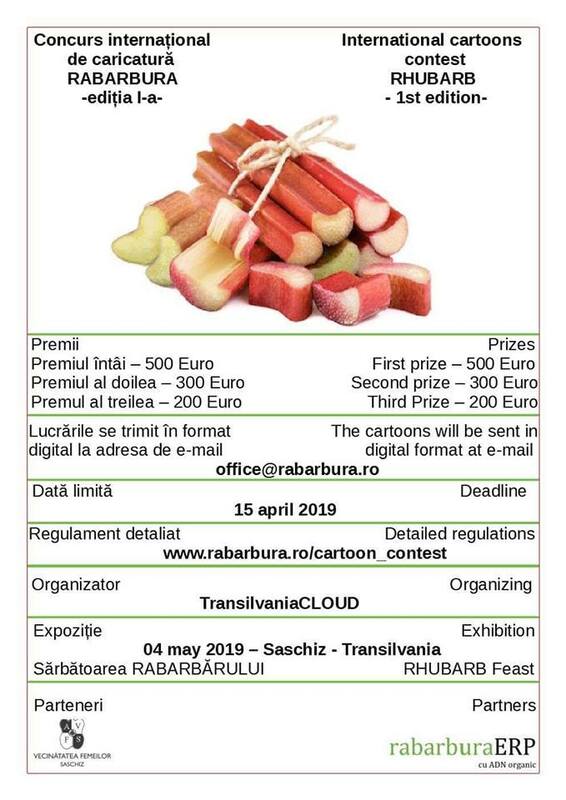 0 Response to "1st INTERNATIONAL RHUBARB CARTOONS CONTEST 2019 – SASCHIZ –TRANSILVANIA"